This this our dedicated help, advice and testing results section for padlocks. Every time we get a good question from a customer, or asked to test a product, then we post the answer or results here. Use the list of Categories or the Search Box below to find the answer you're looking for. Don't worry you can get back to your basket our products by clicking our logo above. What are the different types of padlock? Padlocks come in many shapes and sizes each with their own properties to increase security, make them more convenient to use or protect them from the weather. Here we explain their merits and what makes them ideal for different situations. A common design is the closed shackle padlock. This means that the shackle is guarded in some way, making it more difficult to attack with a saw or bolt cutters. Usually the body of the padlock is extended upwards and around the shackle. Many insurance companies will have a minimum requirement that a padlock used as a security device is of a closed shackle design. It is important however to remember that by enclosing the shackle it reduces the usable clearance of your padlock. 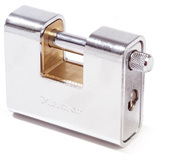 The clearance is the area between the shackles that enable you to lock it through a hole, around a bar or onto a cable. Remember to check the full dimensions on our site before making your decision. The next most common design is the straight shackle padlock. 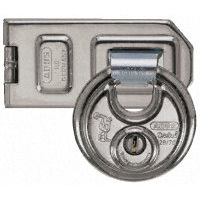 These are commonly known as shutter padlocks since they fit perfectly on to the locking fitment of steel roller-shutter doors. Many people are however misled to assume that they are only designed for roller-shutters. In fact they are excellent all round padlocks and afford the classification of a closed shackle padlock simply due to their unique design. They are often used to secure shipping containers and large warehouse doors because of their high security nature and ease of fitment. The discus padlock has been discussed in greater depth here but as the name suggests this style of padlock has a curved shackle that goes right the way around its circumference. The very design automatically affords it the status and security rating of a closed-shackle padlock. The padlock body itself is not solid, contrary to the traditional padlock design. The circular shackle is enclosed in two opposing metal cases to form the disc. The keyway is then situated directly in the centre of the lock. Since the shackle is not spring loaded, damage to the keyway barrel by force or drilling will not open the padlock and it will remain disabled and locked. It is for this reason that they remain a highly popular choice. These are not strictly a unique design but simply a traditionally shaped padlock with an extended shackle (the U-Shaped bar). By extending the shackle it does make the padlock more convenient by increasing the locking area and as a result they prove highly popular. However, since the shackle is the weakest point of the padlock, increasing its size inevitably reduces the security rating allowing bolt cutters and saws more room to manoeuvre.